Send Angelic Roses Bunch to Chennai. Gifts to Chennai. Send Flowers to Chennai. Description : Enthrall your loved ones in Chennai by sending this pink roses bunch on any upcoming occasion. 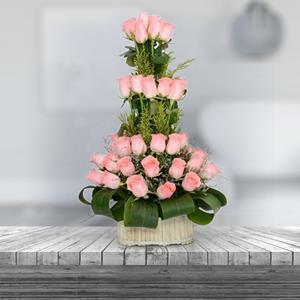 The arrangement presented to you by Gift2Chennai.com comprises of 50 Pink Roses in a tall basket with a height 23 inches. It is skillfully decorated with leaves and ribbons. You can also add other Gifts to Chennai from this site if you want.